A French journalist has said that Turkey is essentially an Islamic Caliphate. The Islamic fundamentalist side of Turkey is strong and present and the country isn’t on the same page as the the EU, says Pascal Celerier writing for Boulevard Voltaire. 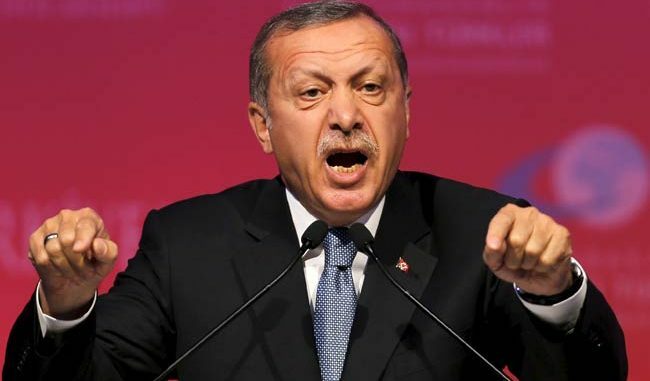 Celerier suggests that Europe needs to wake up to the rise of Islamic extremism and realise that Ankara is competing with Tehran for political Islamic influence in the Middle East. Europe needs to take a tougher stance towards Turkey specially after the downing of the Russian Su-24 bomber and the interruption of a moments silence for to the victims of the Paris attacks with cries of boos and shouts of “Allahu Akbar” at a Turkish stadium. Turkey is dreaming of becoming a great power once again. The country is essentially “an Islamic caliphate” which is currently in the process of trying to re-establish the Ottoman Empire, Celerier argued. The world might soon witness a confrontation between Ankara and Tehran, as the two cities would compete with each other to become a leader of a new empire in the Middle East, the French journalist said. There would be a rise of new, more politically and economically powerful “Islamic caliphates” in the future. Turkey will be one of them, the author said. The French government needs to understand that ISIL is simply a tool in the grand scheme of geopolitics. ISIL isn’t a “third Reich” and it would be defeated soon; however a victory over ISIL would only be a part of a bigger problem that France and the EU have in front of them — the rise of global Islamic fundamentalism in its aggressive and expansionist form, Celerier said.